This is a Leutz model L made in 1922. This is definitely the most prized radio in my colletion and one of the rarest. It was found sitting on a flea market table at the Charlotte Ham Fest. we can determine is that there are maybe 5 or 6 of these in existence. It was designed by C.R. Leutz and sold by E.I.S. (Experimenters Information Service) as a kit because RCA held all of the superhet patents and would not allow anyone to sell a complete set. This radio uses 10 tubes (201A's). 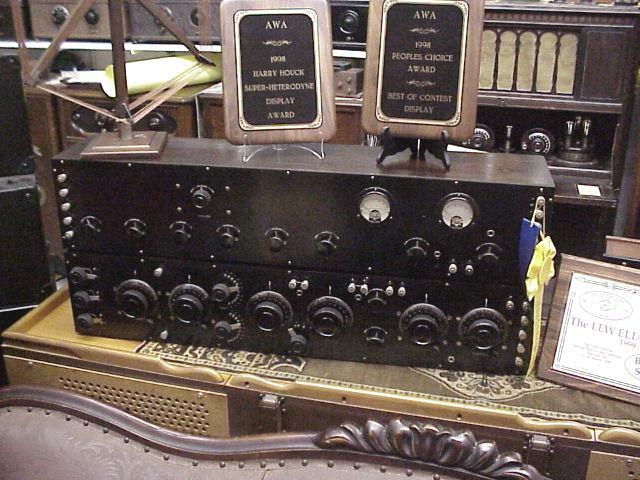 There are 2 cabinets that make up this radio, in the photo they're sitting one on top of the other but they were designed to sit end to end. The only problem with sitting them up end to end is that they are each 40 inches long, that would make a radio that is almost 8 feet long, and then when you had to add an audio amp because the set has only one stage of audio, and then a horn speaker you wind up with a radio that's almost 10 feet long. I have entered this set in 2 contests, at the 1998 AWA Conference in Rochester NY it won first place in it's category plus the "Peoples Choice - Best of Contest Award" and the "Harry Houck - Superhetrodyne Award". At the CC-AWA "Spring Meet in the Carolinas in 1999 it won a Blue ribbon in the Super-Het category, "Best Presentation" and "Best of Show". With the exception of replacing the 2 meters, the originals were destroyed, this set is original. It was taken completely apart and cleaned and then put back together being VERY careful not ruin the old patina. Charlotte CC-AWA Conference in 1999.